The schedule for the August Bristol (Ten.) Motor Speedway NASCAR race weekend has been modified, as the Camping World Truck Series race has been moved from its traditional Wednesday night slot to Thursday night. As a result, the track will host three-consecutive nights of NASCAR national-series competition with the Truck Series running Aug. 16, the Xfinity Series Aug. 17 and the Monster Energy NASCAR Cup Series closing out the weekend on Aug. 18. 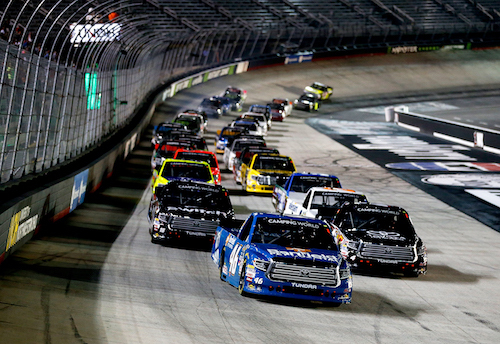 Previously, the August race weekend at Bristol included a Wednesday race for the Truck Series, followed by Xfinity and Cup series races on Friday and Saturday nights, respectively. The race at Bristol has been one of two races on the Camping World Truck Series yearly schedule traditionally held on Wednesday night, with the other being the yearly visit to Eldora Speedway in Rossburg, Ohio, the only NASCAR national-series race on dirt. The Eldora race is scheduled for July 18 this year. Also, the NASCAR Whelen Modified Tour race will make the move to Thursday, remaining a same-day event to the Truck Series race. In addition to the date change, the Truck Series race also will make a network change, as the live broadcast of the race will be on FOX, as opposed the the series’ regular TV home, FOX Sports 1.